Wadsworth was born in Duxbury Massachusettes in 1843 and died in Bridgewater Massachusettes in 1926. Captain F. G. Wadsworth, who was in command of the U.S. Treasury cutter "Algonquin" around the Spanish - American war. The grouping includes, (1) several invitations to a variety of dinners/events; (20 Four letters to Wadsworth from the Office of Secretary of the Treasury Department, captain C.F. 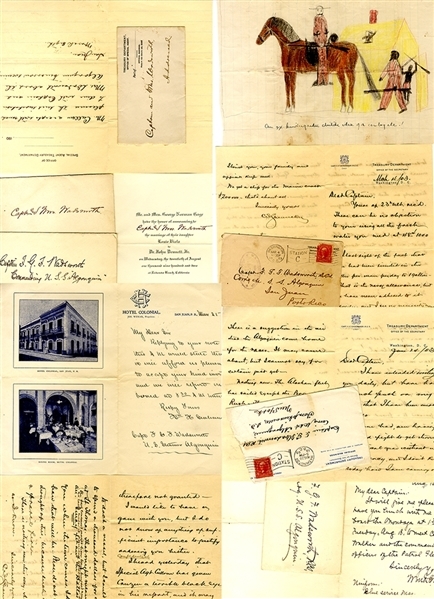 Shoemaker; (3) Four Tickets to the America Cup races, 1903; (4) Various blank letterheads.